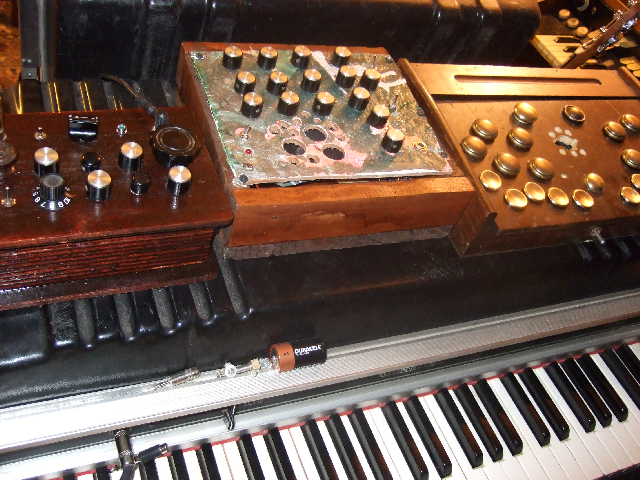 you wanna see lots of strange early electronic instruments? All we need is a name. Just this name. An old organ technician told me something amusing. He says that the relay shown here is a MAJOR weak spot in the Sideman’s design. 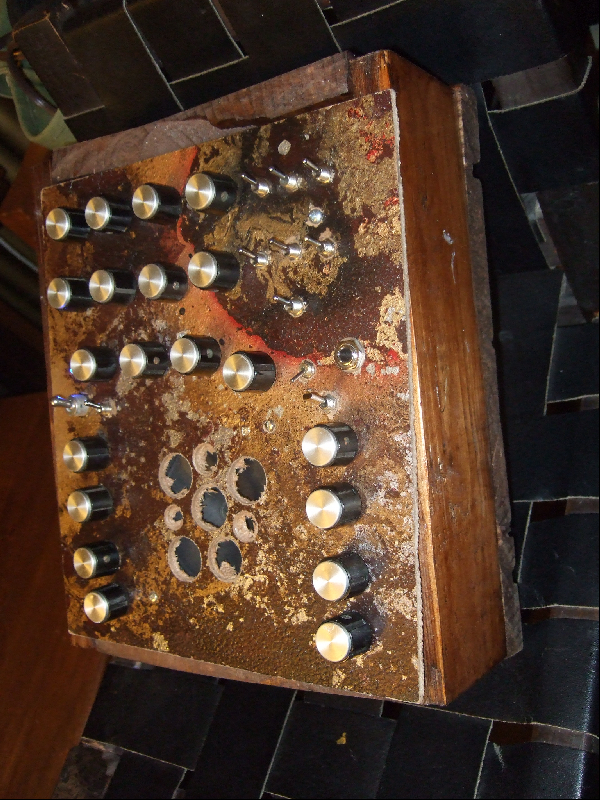 It was custom made for Wurlitzer, it’s a high-impedance coil that burns out easily, and replacements are impossible to find. It has 12 poles–ever tried to buy a 12-pole relay? The fix is even more stupid. All this relay does is to enable the drum pattern (via the START knob on the panel). Simply hold the relay closed with a rubber band, and control the output with the volume control. But people who find old Sidemen rarely think to try this…. 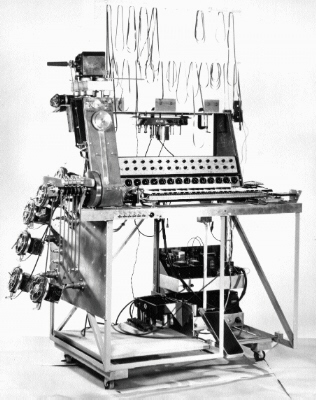 If only one could buy such a mechanical monster today — preferably with MIDI output. I was told that lots of Sidemen got scrapped simply because that rubber belt broke, and the owners were too old/senile to get it fixed…..sounds like ageism to me. 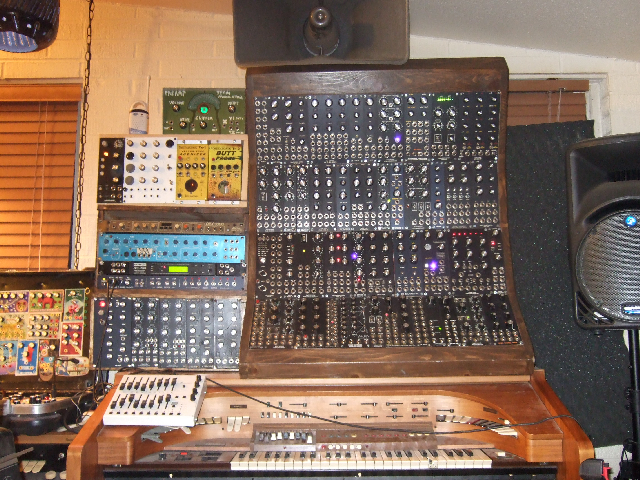 My question is: 50 years from now, will you be able to plug a modern digital drum machine, and find it still works? Hah. This is the control panel. It’s quite difficult/costly to get that kind of chemically-etched brass panel made today. The BLOCKS and CYMBALS knobs are rotary selectors that provide five different variations for block and cymbal patterns, plus totally disabling them. I must assume some of those home organists found a use for this–because the amount of switching required to implement the function is frightening. Above the start and volume knobs are two neon lamps that flash in time with the rhythm. Cool stuff, cool sounds, thanks for entertaining me and wish I was there in the picture. Here is the left side. 9 tubes in the sound section, and a power amp made with a 12AX7 and two 6BQ5s. 2-way speaker with two tweeters, one coaxial with the woofer and the other on the front of the cabinet, under the control panel. The big aluminum disk turns the contact arm–it is driven by the motor thru a rubber belt and a rubber idler wheel. The speed slider on the control panel drags the idler on the disk, closer to the center and the rhythm runs faster. Power is shut off by pushing the slider all the way rearward. All the tubes in this thing were original, dated 1958, and still good. I’m fixing this one for a friend. Introduced 1958. 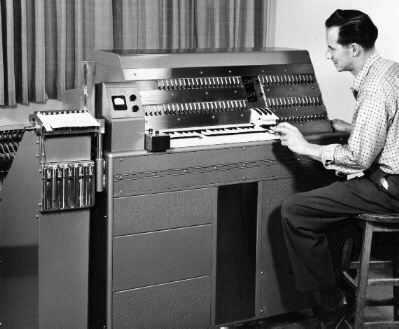 In this view we see the “pattern sequencer” — a large printed circuit board (the only one in the unit) with a set of contacts on a rotating arm. 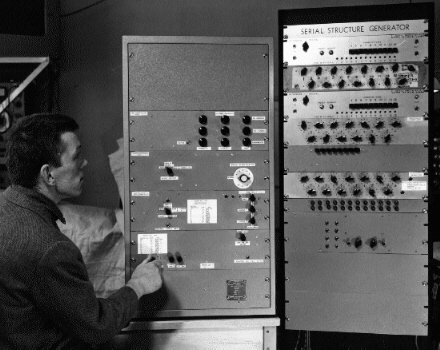 The contacts close circuits and generate trigger pulses, which hit vacuum-tube ringing filters to generate most of the drum sounds. This unit was in remarkably good condition, if you don’t count the ugly black padded naugahyde someone put all over the outer cabinet. …no mORe talk oF thE out of DAte- is thiS thE year 0! This was a horrible Chinese combo keyboard (no brand name) I found long ago, at a Longs Drug store for $5. It contained exactly one chip on a tiny PC board – plus a lot of buttons and a 3-octave keyboard. I cut it down and installed it in a small box. Switches allow you to misconfigure the scanned function-selector buttons, the knob drags the pitch waaaay down. Instant Skinny Puppy happy pop music. Runs on 4 AA cells. 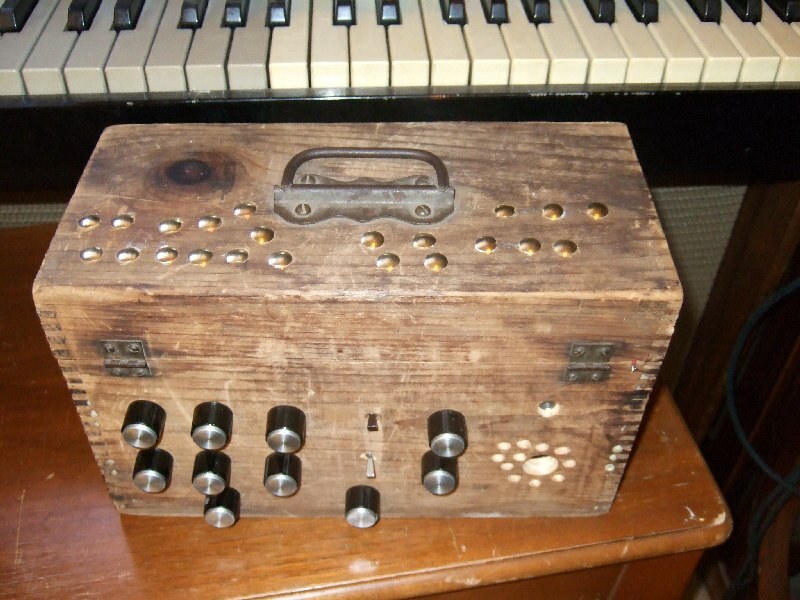 Welcome to Deviantsynth.com – a music/musical equipment/ephemera related community centered blog with a difference.